Searching for some new comforting foods to serve this winter? Look no further, as here are 10 soul-warming dishes to soothe the soul and keep the cold at bay. Meaty veal shanks turn meltingly tender when braised slowly in wine and vegetables. Plus they each hold a delectable nugget of marrow in the hollow bone. 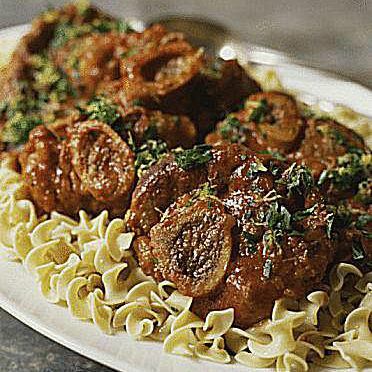 Serve the shanks over buttered egg noodles or fettuccine and be sure to include a tiny spoon for scooping out the marrow. This is comfort food at its best! A true American classic, this recipe for baked macaroni and cheese couldn't be easier or more comforting. It's also a very versatile dish, lending itself to many variations. For example, no reason to stick to elbow macaroni for the recipe, try it with penne, rigatoni or rotini. And you can mix-up the cheese you use, too. How about a mixture of cheddar and Monterrey Jack, or Gruyere and fontina? The variations on the dish are only limited by your imagination. There are about as many versions of a pot of gumbo as there are cooks who make it, and this is merely one take on the legendary dish. But one thing all good gumbos have in common is a roux - a blend of flour and oil cooked until an amber brown color. The unmistakably rich, nutty flavor that it adds to the soup/stew sets it apart from the ordinary. The best part about this beef stew is that once you put it together, it requires no attention, not even stirring. For a great meal, serve it with some buttered egg noodles. I love this recipe for its hearty flavor and incredibly easy preparation. The beer gives the dish a deep, robust flavor. For the best Irish flavor, use Guinness Stout or another stout. What's more, you can use boneless beef chuck or round stew meat instead of the lamb with equally delicious results. Serve with garlic mashed potatoes. Although this dish is called a “pie,” there isn’t any pastry involved. It is simply a mix of ground turkey and vegetables in a sauce with a topping of mashed potatoes. The dish is browned in the oven for a delicious example of comfort food. For a pretty effect, pipe the topping over the filling, using a pastry bag fitted with a star tip. In my opinion, just any time is a good time to eat chili, and this recipe cooks up into a real crowd-pleaser. Serve the chili with lots of toppings for hungry diners to choose from, such as chopped cilantro, sour cream, chopped avocado, shredded cheese, chopped scallions, chopped tomatoes and even some raisins or pine nuts. Many people complain that the eggplant in their eggplant parmigiana turns out soggy and oil soaked. This recipe solves that problem by salting the eggplant ahead of time to draw out the water and leaves the eggplant crisper.